Hotel “Psiloritis” is a newly build complex (2008, renovated 2015) of 8 double occupancy studios / apartments. Each, measuring approx. 22.5 m2 (225 sq ft), is located in one of two adjacent buildings. 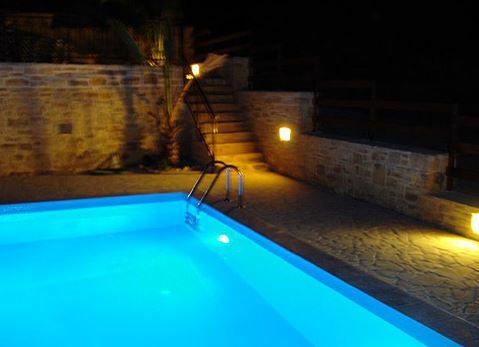 Everything outside is very esthetically set-up, from a heated and illuminated swimming pool to the lightings around the premises. 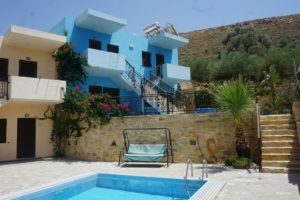 The nice atmosphere will encourage you to enjoy the sun at the pool, where you can also admire the views of the sea and the mountains with its highest point on Crete, Psiloritis. Psiloritis is covered with snow from November to May, which makes the view even more picturesque. Hotel “Psiloritis” is surrounded by the natural stone fence, palms and flowers in typical Greek pots. The outdoor parking is available for hotel guests.